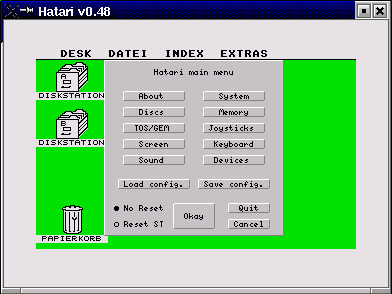 Hatari is an Atari ST/STE/TT/Falcon emulator for GNU/Linux, BSD, Mac OS X, Windows and other systems which are supported by the SDL library. The Atari ST was a 16/32 bit computer system which was first released by Atari in 1985. Using the Motorola 68000 CPU, it was a very popular computer having quite a lot of CPU power at that time. Unlike many other Atari ST emulators which try to give you a good environment for running GEM applications, Hatari tries to emulate the hardware of a ST as close as possible so that it is able to run most of the old ST games and demos. Hatari is open source software and is distributed under the terms of the GNU General Public License (GPL).